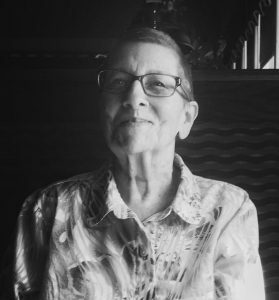 Joan Dusenberry Moore was born in Madison, New Jersey on October 1, 1932 and passed from her earthly life into the arms of her Heavenly Father on the morning of April 12, 2019. She was preceded in death by her parents, John B. and Elizabeth Dusenberry, her son-in-law, Michael R. McLendon, and her husband of almost sixty years, Jack W. Moore. He was the gentleman solely responsible for getting her to Texas as quickly as he could just after they were married in 1956. Joan was a devoted wife, mother, grandmother and friend. She assumed the role of a traditional homemaker, always ensuring that her family came first. Coming in at a close second, however, were animals. She was quite the lover of anything with four legs and the Moore household always had a dog(s) and or a cat(s). Over the course of the last several years, Mom lost the ability to communicate with her voice. As frustrating as that may seem, she always expressed herself with a ‘thumbs up’ and a huge smile. Never one to complain, she will be fondly remembered for maintaining a positive attitude in the face of adversity. Queen, as she was affectionately called, is survived by her devoted children, Debra M. Wallace and her husband, Marvin, Barbara M. McLendon, and Scott T. Moore, all of Houston. Nonnie is also survived by five grandchildren who will miss her interest and attention in their lives. They are Cole Moore and his wife Kelsi, Meredith Bradley and her husband Kevin, Braden Wallace, Meagan McLendon and her husband Austin Norman and Katherine Calderon and her husband Joe. She also leaves several friends that were as close as family, two brothers and their wives, several nieces and nephews and last, but certainly not least, the very recent addition to our family, her first great-grandchild, Jack Ellis Moore, named after her late husband. During the last few years, Mom was cared for by her children as well as several caregivers. We would like to thank Ishyeshia Austin and most recently, Light Heart Memory Care for their unselfish compassion and dedication. A private family gathering will be held to fondly remember our mom and our Nonnie. She will be interred alongside her husband in Center Point, Texas. If so desired, gifts may be made to Houston SPCA, 7007 Old Katy Road, Houston, TX 77024. Rest In Peace, sweet Momma and enjoy chatting with all those who have gone before you…a life well-lived and an eternity well-deserved. Debbie, Barbara, and Scott – Just heard the sad news of your Mom’s passing. I always remember her smiling, friendly, and nice. Both your parents were good people. You have my condolences and will be in my thoughts. I’m so sorry to hear about Joan passing. She is now at home with our Lord Jesus and her wonderful husband Aggie Jack. No more pain she has her new body living at peace once again. It has been my honor and privilege to know Joan. She was such a great friend and person. A true Christian. I will miss her badly. To Ms. Joan’s family It was a pleasure to be a part of Ms. Joan’s life here at Light Heart Memory Care her infectious smile will truly be missed.